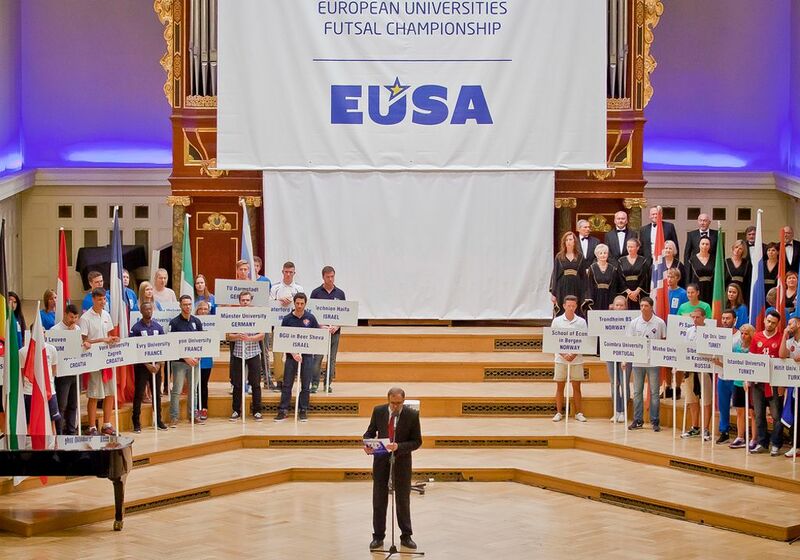 On 1st August 2015 in the Aula Lubrańskiego of the Adam Mickiewicz University, the Opening Ceremony of the 10th European Universities Futsal Championship was held. About 500 athletes in 22 men’s and 7 women’s teams, representing 29 universities from 14 countries completed from August the 2 to the 9 in 3 sportcenters in Poznan, Poland. The Ceremony opened with the colourful procession of all the teams taking part in the Championship. The President of Wielkopolska Region University Sports Association and Chairman of Organizing Committee Mr Tomasz Szponder started the ceremony by welcoming all guests and competitors. Following that, Mr Adam Roczek, EUSA President said: “the participants will not be dissatisfied of what has been prepared for them by the province of Wielkoposka”. He also emphasised the magnificent role of Poznan as a strategic city for the development of academic sport. In the end he expressed his thanks to the Organising Committee and other parties involved in the preparation of the Championship. The last words were spoken by the deputy mayor of the city of Poznań, Mr Arkadiusz Stasica who noted: “I hope that the spirit of sports rivalry will be encouraging you throughout the entire tournament and contribute to achieving best possible results and successes”. In the end, with a great pleasure, Mr Stasica officially announced the Championship open. The second part of the ceremony was comprised by performance of the Polish national anthem, followed by Gaudeamus Igitur, the EUSA and university sport official anthem. After that, the ceremony proceeded to the oaths by representatives of athletes and officials. The evening ended with a cultural performance. 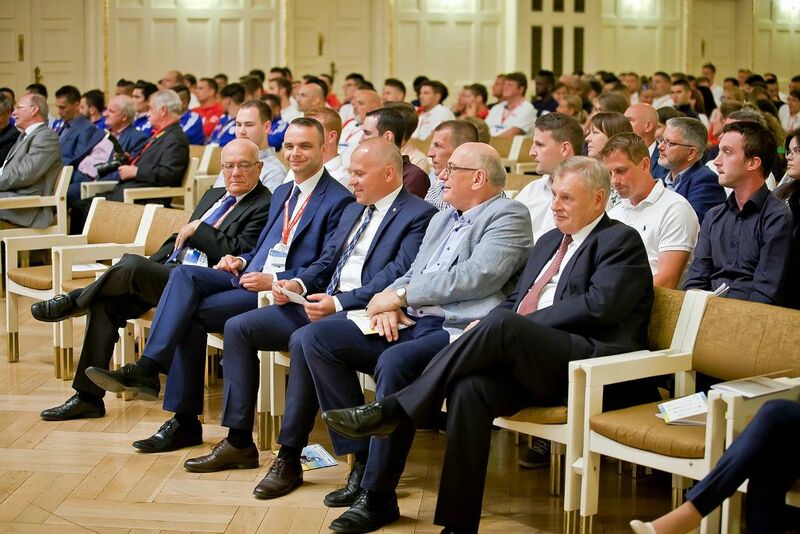 The European University Sports Association (EUSA) was represented at the event by Mr Arie Rosenzweig in the presence of EUSA President Mr Adam Roczek, with Technical Delegate Mr Tomasz Aftanski, assisted by Mr Marko Brcic. Together with the Organisers they were making sure the event will offer top conditions for the participants. 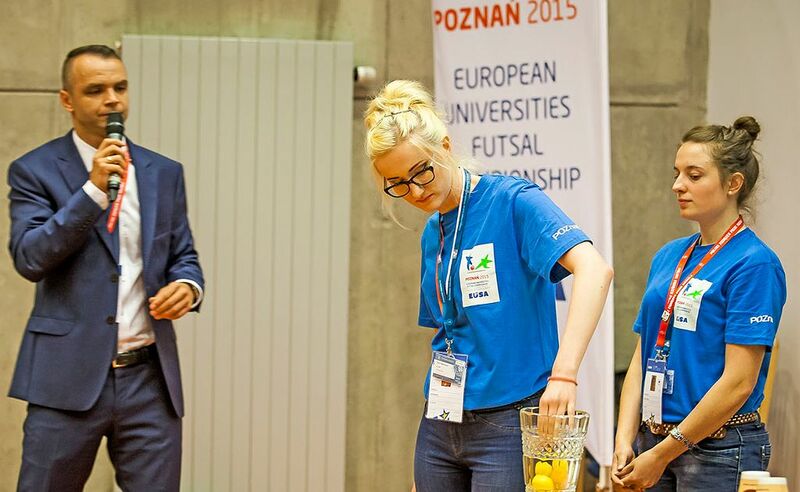 After 8 days of competition, 92 matches at three sports hall, 22 men’s and 7 women’s teams from 14 countries, the 10th European Universities Futsal Championship 2015 has come to the end on August 9, 2015 in Poznan. In women’s championship, the team of the University of Rouen after presenting the solidest disposition over the whole tournament claimed the title winning 5 out of 6 matches, including a thrilling match against Munster University, a future European vice-Champion. The podium was complemented with Ege University, which as the only team felt the taste of a victory against future 10th European Champion. Unbelievable tournament organised in Poznan was secured by over 70 volunteers that took care of almost 460 players, referees and delegates. Fans could not only watch matches live, at three just build up sports halls but all the matches were streamed online. Although the 10th European Universities Futsal Championship is now over, the 11th edition will take place in Corum, Turkey in July 2017, and futsal will also be a core part of the European Universities Games 2016.